The dedicated gaming arm of Thermaltake, Tt eSPORTS, was showing off its new range of keyboards at this year’s Computex show in Taipei. I had a quick go on one there, and now I have my very own, whirring away on my desktop. Whirring away? Yes, the key gimmick setting this apart from the host of other gaming keyboards out there is the addition of a moveable little fan blowing air over your poor, sweaty gamer’s sausage-fingers. You can mount it on either side of the board, and you can also completely remove it and stow it away inside the plastic surrounds. On a particularly long gaming sesh it will help to cool off your digits, reducing any of that potentially lethal finger slippage. What I don’t approve of, though, is the whining sound associated with the tiny fan, operating at a frequency that’s almost, but not quite, beyond the realms of human hearing. Elsewhere it’s very much a standard gaming keyboard, with all the recordable macro functionality we’ve come to expect from such peripherals. The keys are solid with a reassuring action to them, and have a fairly long travel so you really have to press them, eliminating a lot of mis-strikes. The USB 2.0 port on the rear is useful too, especially as it operates only on a single USB cable connected to your PC. 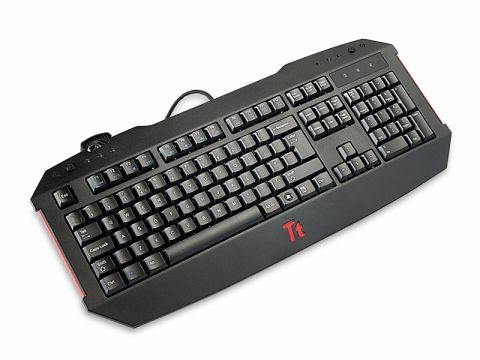 So it’s a steady gaming keyboard – nothing special and nothing that bad. But for £60 I still kinda want something a little bit special.